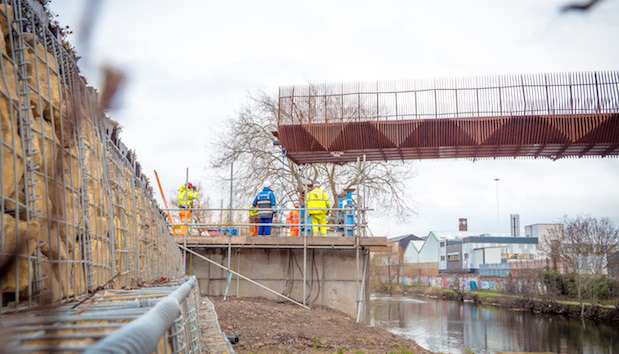 Developer Citu hit a new milestone at its Climate Innovation District scheme in Leeds this week with the installation of a 50-metre pedestrian bridge. The £1.5m steel structure, lowered into place using a 1,000-tonne crane, will provide a link between Leeds’ South Bank and the city centre across the River Aire. It will also link phases one and two of the £125m Climate Innovation District, which straddles the river. The cost of the bridge was supported by a £1m loan from the Leeds City Region Enterprise Partnership (LEP) Growing Places Fund, which offers loans to kick-start stalled development or infrastructure projects that will deliver homes, jobs and other economic benefits. To date, the Fund has helped launch the development of over 222 acres of land. The three-metre wide bridge was engineered to accommodate  the city council’s planned £40m district heat network over the river, all of which is part of the wider South Bank regeneration project. The district heat network isn’t required for the homes in the Climate Innovation District, because of the properties’ airtightness and low energy needs; but it will offer existing and future developments the opportunity to benefit from a network harnessing heat generated at the Recycling and Energy Recovery Facility over at Cross Green. The bridge will officially open later this Spring. Citu MD Chris Thompson said: “This is a huge milestone not just for the Climate Innovation District but Leeds South Bank as a whole. He continued: “Citu’s whole ethos is to offer a model of how to build zero carbon neighbourhoods that also provide healthier, smarter and better-connected cities. The chair of the Leeds City Region Enterprise Partnership (LEP), Roger Marsh OBE, commented: “The Climate Innovation District is one of most exciting developments in the UK and is totally transforming the South Bank area of the city.